In a previous blog post, I wrote about the “serials crisis” that has threatened to undermine, and restrict, the existing economic model of the dissemination of scholarly communication through academic publishing. This week, we discussed the reaction to this crisis through the Open Access model, and also enjoyed a guest lecture from Martin Paul Eve, author of the recently-published book Open Access and the Humanities: Contexts, Controversies and the Future. In a nutshell, the term “serials crisis” refers to the fact that the cost of subscribing to an academic journal has risen much higher than inflation ever since the 1980s, with a resulting squeeze on libraries’ acquisition budgets. This has led to calls for an alternative model of academic publishing that both shifts the financial burden away from the potential readers (many of whom are put off entirely by high subscription and individual article-purchase fees), allows unrestricted access and re-use of research, and the attendant benefits of sharing information. The Open Access movement is derived from the world of computer software licensing: in the 1980s, Richard Stallman published the freely-licensed GNU operating system as a reaction against the growing preponderance of proprietary software. Just after the turn of the millennium, Lawrence Lessig founded Creative Commons, which extended these principles to any form of published authorial work; over the next few years, the principles of Open Access were developed and set out by Peter Suber and others following conferences in Budapest, Bethesda and Berlin, leading to phrases such as “BBB Statements” and the “BBB definition” of Open Access. As is clear from this timeline, Open Access evolved in step with the contemporaneous development and growth of the Internet, and one of the key points that underlies the movement is that the low cost of disseminating digital works via this technology has rendered traditional publishing models obsolete. The term ‘open access’ refers to the removal of price and permission barriers to scholarly research. Open Access means peer-reviewed academic research that is free to read online and that anyone may redistribute and reuse, with some restrictions. Gold—the article is made freely-accessible (usually by publishing under a Creative Commons license) by the publisher and is funded by an Article Processing Charge (APC) which is paid by the author, their research institution or other funding body. The cost of publishing is therefore shifted from the demand-side (the audience) to the supply side. Green—the author deposits a pre- or post-print copy of their article within an institutional repository, subject to certain provisions as set out by the publisher (for instance, the author may only be able to submit a pre-print copy that has not been subject to professional copyediting or typesetting standards, or the article may be embargoed until a certain time has passed since publication). Libre—the article is free to read and also reuse, for example for the purposes of text- or data-mining. The massive change that the Open Access models represent in comparison to the subscription-based publication paradigm has caused, and will cause, a number of problems, such as the uncertainty of guaranteeing financial viability with unproven economic models, the high cost of developing “hybrid” or “legacy” Open Access models that are based on the adaptation of existing subscription-based systems, the difficulties in persuading researchers—who traditionally are pressured into publishing in the well-established “prestige” journals—publishers and even librarians to adopt a totally new system, and the fact that humanities subjects face additional challenges in a movement that was initially driven by the sciences. These include the fact that arts and humanities research is less well-funded than its scientific equivalent, thus making it harder to pay APCs, and the fact that the “half-life” of an arts of humanities research article is likely to be significantly longer than a scientific one, causing complications to the Green Open Access model. Despite these challenges, the Open Access movement has nevertheless made significant progress in the decade or so since it was launched. In the United Kingdom, recommendations made by the 2012 Finch Report led the government to mandate Open Access publishing models for publicly-funded research (making the country one of fourteen to adopt such legislation); a model which has also been taken up by institutions such as the Higher Education Funding Council for England (HEFCE) and the Wellcome Trust. It appears that the Open Access movement is currently at a watershed moment during its history, and could soon become the prevailing model for scholarly publishing if current trends continue. In our fourth LAPIS issue of term, we discussed the often thorny issue of intellectual property law and how it fits into the library and publishing sectors. The principle of copyright—the aspect of intellectual property that is most likely to be of relevance to librarians—dates back to when the development of the printing press and related technology made the mass copying of authors’ works feasible; prior to this, works had to be copied out manually by professional scribes, which was a laborious and accepted part of the publishing process. An act for the encouragement of the arts of deſigning, engraving, and etching hiſtorical and other prints, by veſting the properties thereof in the inventors and engravers, during the time therein mentioned. 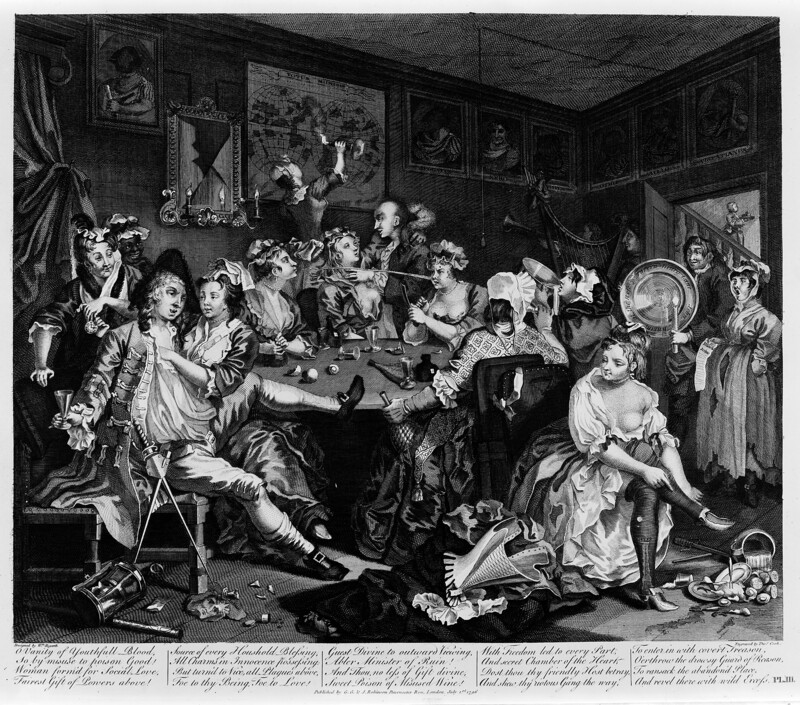 The Engravers’ Copyright Act was sponsored by William Hogarth, the renowned artist and engraver who was a prominent victim of unauthorised copying. Much of his work carries a strong moral message, including this scene from A Rake’s Progress (also published in print form in 1735). Over the following centuries, this copyright principle was extended to cover all forms of intellectual and artistic authorial works, and in general the framework of laws, in the United Kingdom and in other countries, held together. Yet the advent of the current digital age has posed significant challenges to this model, as the interconnectedness of the Internet combined with ever-advancing computer technology has made it much more simple to copy, modify and disseminate these works. Moreover, the very nature of digital technology raises its own questions: is a digital file in itself a copy of something else? Do multiple different saved versions of the same document (perhaps backed up automatically by the author’s own computer) count as copies? And so forth. Often this is not done for any commercial gain, and the creation of another copy, although technically piracy, can be said (for example, by legal scholar Stefan Larsson) to differ from “theft” as the creation of a copy does not remove the original. Overall, the gradual extension of copyright, in the forms of “all rights reserved”, to include all published works by default is incompatible with contemporary socio-cultural norms driven by technological progress, as argued by theorists such as Lawrence Lessig, and alternative models are needed to prevent creativity and entrepreneurship from stagnating due to unnecessary and unworkable restrictions. Creative Commons has been extremely successful, and is used by a variety of companies and organisations, including the WhiteHouse.gov, Al-Jazeera, Google, Wikipedia and Flickr. If you look at the bottom right-hand corner of this blog, you can see that its original contents are licensed under the Creative Commons, which produces handy graphics, links and HTML snippets for authors (like me!) who produce Web-based content. It should be borne in mind that Creative Commons is intended to complement traditional copyright laws, not to supersede them. In the United Kingdom, copyright law continues to be modified as the digital ages poses new challenges: in 2014, for instance, the rules concerning the making of personal copies for private use and the making of derivative works including quotations and for parody were relaxed. Copyright is a particularly tricky subject for libraries, which need to balance respecting the law, encouraging authors to produce information, and facilitating unrestricted access to this information. British public libraries pay authors, via the Treasury, royalties for books that are circulated to their authors, illustrators and other contributors through the Public Lending Right scheme, but this has faced challenges in recent years, due to both technology changes in the form of e-books, and the fact that many public libraries are now community-run following recent government expenditure cuts. We can but hope that updating the legal framework, as Creative Commons has proved it is possible to do for freely-licensed works, will help libraries to continue providing satisfactory user access to information.